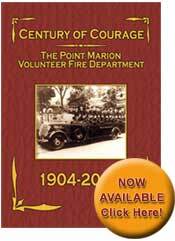 The Point Marion Volunteer Fire Department (PMVFD) is a registered 501c(4) non-profit organization that has served the borough of Point Marion, Pennsylvania and its surrounding communities for over a century. Situated on the forks of the Monongahela River and the Cheat River, the department is located approximately six miles north of Morgantown, West Virginia and twelve miles south of Uniontown, Pennsylvania in Fayette County. It is the departments goal to ensure the welfare of the citizens it serves and protects by minimizing the loss of life and property from the ravages of fire, and rendering aid in case of catastrophe. In addition to fire protection services the department specializes in vehicle, heavy vehicle and bus rescue; high-angle rope rescue; public safety diving and water rescue; and Advanced Life Support (ALS) Emergency Medical Services (EMS). The department also maintains an active level of involvement within the community by providing services such as public education about safety, first aid and CPR. The department is home to many of the areas residents with a total membership of nearly 90 individuals from various facets of life. It is through the tireless efforts of these individuals, and the continuing support of the public, that the department continues to progress into the 21st century. We welcome you to browse through our site and learn more about our organization and the people who make it a reality.